Young Ko, M.D., Lancaster | Advanced Sleep Medicine Services, Inc.
Dr. Young Ko has been in private practice for over 30 years and is boarded in critical care, pulmonology and sleep medicine. He has served the communities of the Antelope Valley with up-to-date pulmonary knowledge and new procedures including a treatment for patients with severe persistent asthma called Bronchial Thermoplasty. Dr. Ko performs Endobronchial Ultrasound and Electromagnetic Navigation Bronchoscopy with biopsies for the staging of lung cancer, therapeutic and diagnostic bronchoscopy, percutaneous lung biopsy, percutaneous tracheotomy, and thoracoscopy. 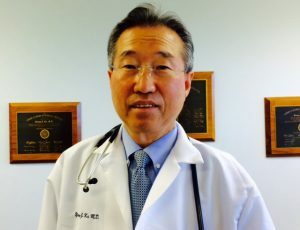 Dr. Ko is a primary care physician that treats a variety of internal medicine disease including diabetes, hypertension, thyroid disease, hypertension, etc. Dr. Ko treats patients with a variety of pulmonary disease processes such as COPD (Chronic Obstructive Lung Disease), asthma, patients with lung cancer, valley fever, bronchitis, and emphysema. Also, he interprets pulmonary function tests. Dr. Ko is also specialized in the management of life-threating conditions that require intensive monitoring, invasive medical intervention and supportive measures. Dr. Ko interprets sleep studies, as well as treats patients with sleep disorders such as obstructive sleep apnea syndrome, central sleep apnea, insomnia, hypersomnia, narcolepsy, and sleep associated hypoxemia.